Garden fence stains come in many forms from protective wood treatments through to decorative stains and paints. The type of product you need largely depends on what type of colour you want, the condition of the fence and any protective requirements you prefer. New fence panels rarely need staining as they have either been pre-treated with a coloured wood treatment or have the natural colour of the wood used to make the fence panel. This doesn’t mean that the existing colour can’t be changed or enhanced if a stronger colour is required. For example, light brown panels can be treated and stained with a dark brown wood preserver whilst green coloured panels can be stained with a stronger or darker green wood preservative. Untreated fence panels will eventually turn grey or silver overtime, usually in just a couple of years depending on how much water and UV (ultraviolet) light they are exposed to. Applying a coloured wood preservative to a fence panel that has been bleached will mean that the final colour won’t be influenced by any pre-existing colour of the wood or previous treatments. Before staining old fence panels it is highly recommended that any traces of mould, algae and biological growth is first treated with a mould and mildew cleaner. This will help to kill the mould spores in the wood and with the aid of a wood preservative, clear or coloured, will help to prevent future growth. Apart from keeping the fence looking nice, it’ll also help to prolong the life of the fence panels. 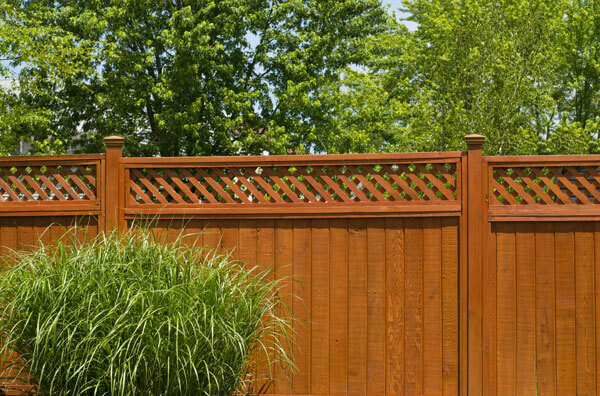 The definition of a garden fence stain can be difficult to quantify. An example of this are exterior wood preservatives, although their primary purpose is to protect garden fences and other garden wood from mould, algae, fungi, wood rot and insect attack, they also come in a range of colours and tones to stain and change the appearance of wood. 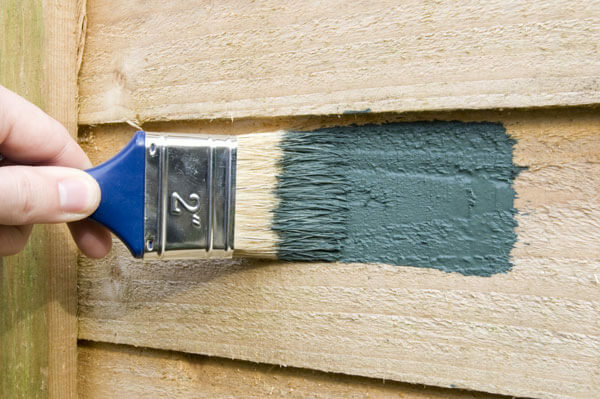 In the same way, many garden paints for sheds and fences could be classed more as a stain than a paint in the way that they penetrate in to the wood grain and stain the timber rather than coating it like a domestic interior paint. Exterior wood, including garden fences can also be stained by using an coloured exterior wood oil. A great example of this is coloured decking oils which will both stain and protect fences against weathering. Many decking oils also contain UV Filters which will protect the colour of the stain for longer. Its worth mentioning that fence panels come in many shapes, styles and different wood types. Although the majority are made from soft wood, rough sawn timber, high end fence panels are available in smooth planed hardwood timbers. Rough sawn softwoods are more porous which means that they will absorb more of the product meaning less coverage and a darker colour whilst smooth planed hardwood fence panels will use less product usually resulting in a lighter colour. The ideal time to stain garden fences is Spring through to Autumn when several days and nights of dry weather, and where temperatures remain above 10 degrees centigrade are expected. This gives the fence panels time to fully dry out before and after any fence stain is applied.